Silk Talit with wool Tzitziot "Rabanut" Kosher for adults, for Festive and ordinary synagogoue use. All our Talitot are kosher and made in Orthodox Bnei-Berak under superior Jewish authorities supervising. 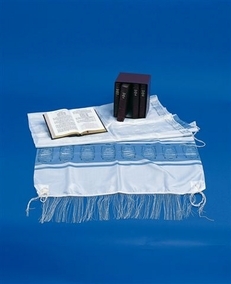 The Tallit ( tallis ) is a prayer shawl that is worn during the morning Jewish services in Judaism, during the Torah service, on Yom Kippur, and other holidays. It has special twined and knotted fringes known as Tzitzit, attached to its four corners. The bible mandates that the tzitzit contain a thread of blue known as tekhelet. Since the bible itself does not describe how to tie the tzitzit, interpretation of the oral tradition has resulted in a number of methods of tying. The Tallit might be purchased to mark a special occasion, such as a wedding or a bar/bat mitzvah, and considered as a close family gift. Many parents purchase a tallit for their sons at the age of 13, at the same time as they purchase the Tefillin. According to Rabbinic Judaism, the important part of the Tallit is the tzitzis. The use of a Tallit in the Reform community declined in the 20th century, but in recent years, both men and women have begun to wear them during prayer services. 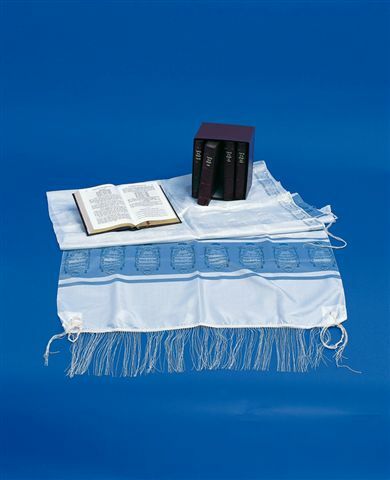 Bible Land Shop is proud to have such a great Kosher Jewish Tallit in stock.